Become a skilled trader in Ubisoft's addictive strategy game. Apple's iPhone has a plethora of time management games, including the popular hit, Diner Dash. Now you can add one more to the list with Dawn of Discovery: Harbor. 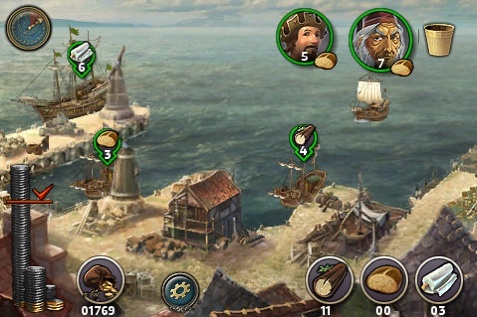 Based on Ubisoft's civilization building series, this well designed and addictive App casts you as a harbormaster, tasked with exchanging valuable items with eight unique traders. While it doesn't have as much content as we'd hoped. Its $2.99 price tag makes it an irresistible impulse buy. Like most time management games, your goal is to satisfy customers before the clock expires and/or they grow angry the leave. Succeed, and you'll earn lots of cash, move on to the next stage and achieve certain milestones that include expanding the dock to serve additional ships or a promotion to another harbor. Naturally, this is easier said than done, as you must allow the right people to come in while making sure that you have ample quantities of the goods they desire. These include almonds, spices, fabric, bread, wood and other items. That said, although you always know what good a particular trader carries, it's impossible to tell which one he or she desires, meaning you should never put all of your proverbial eggs in one basket. Don't, for example, load up the dock with people who bring only wood, because you won't have anything to trade. While it takes a bit of strategy to beat the game, Ubisoft made it simple to play. Each harbor has a set number of spots to dock, and potential traders appear along the top of the screen, accompanied by a small icon representing the good they wish to trade. If you want a particular person to dock, simply place a finger over their respective icon and drag it to the desired location; their ship will immediately fill the spot. From there, they'll unload their item and then make a request. To satisfy him or her, just place a finger along the good in your inventory and drag it to their ship; they'll load up the number of the item they asked for and sail away. Obviously, it becomes a bit more complicated. Some traders don't like to wait long, and you'll eventually have docking spots that may potentially block and thus prevent another trader from leaving. On top of that, nothing hurts worse than falling a bit short of reaching the level's monetary goal. You'll have to restart. 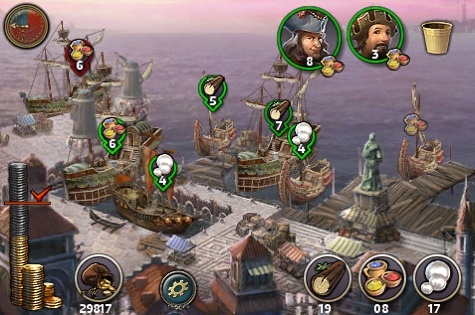 Despite the increasing difficulty, Dawn of Discovery: Harbor is an entertaining video game, with 36 stages set across four unique harbors (Corsair, Venice, Occident and the Orient), each of which has attractive scenery and epic music that fits the fifteenth century time period. There isn't much to the presentation, since the harbors are static 2-D images with ships coming in and out, but everything still looks great, and you can tell that Ubisoft put a decent amount of effort into designing each location and scoring appropriate music. The only downside is the game's short length. You'll probably blow through it in a day or two, depending on your skills. But at three bucks, there's no reason to avoid Dawn of Discovery: Harbor. Kudos to Ubisoft for bringing the series to iPhone. We definitely hope that it'll consider bringing a full-fledged sequel (similar to the ones on Wii and DS) in the near future. What's Hot: Four unique harbors, fitting music, easy to learn touch controls, eight different traders, good amount of strategy needed to beat the game. What's Not: Not especially long, you'll breeze through the first harbor.